Daniel has our second online ‘I AM’ feature. He is part of a new crew of up-and-coming skateboarders from the city of Johanneburg. 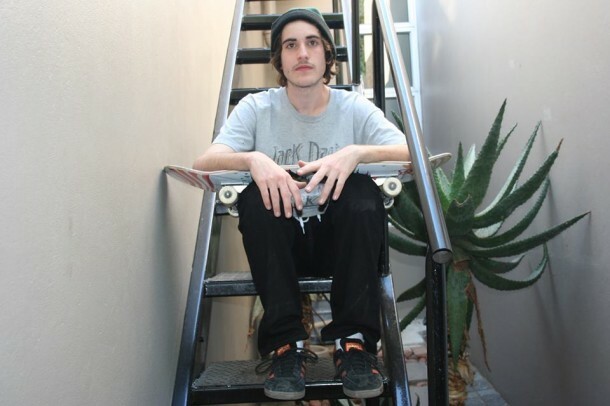 In many recent interviews with JHB skaters and in web clips from that city, Daniel keeps popping up. Like his homie Evan Binge who has his debut in AV 19, Daniel is part of a new breed of local skateboarders who are taking the ‘all-terrain’ approach. So here is Daniel’s official introduction, you’re likely to see a lot more of him in the near future. Thanks to Omphile Bogatsu for filming this clip, conducting the quick interview and supplying the photo. 16, soon to be 17. First skate video you watched? I don’t remember too well, but I think it was Almost Round 3. Skaters that get you hyped to skate (internationally and locally)? There’s too many, off the top of my head, I’d say Evan Binge & Cake boy locally & internationally it would be Grant Taylor, Ben Raybourn, David Gonzalez and pretty much all of the bowl & Thrasher type of skateboarders. An up & coming brand, keep a look out for Vé.G. Who do you skate with on the regular? Cake boy, Jarryd, Bryce, Kevin, Evan, Craig, Ryder, Sid, Louie, Bongi, Diego and Levi & I hit up some dope missions often. I think I’ve got it all covered. Whats poppin’ with the Steez Katz Promo? Hah, there’s a long story to this. It’s going to come out pretty soon. I think there’s been a huge delay due to a lot of, I guess you can call it, politics. After the promos came out I think it’s pretty clear to say that most of us aren’t Steez Katz anymore, I was a kid when we started that stuff and since then we’ve all changed for the better. After the promo I’ll be representing W.B&B * Vé.G, that’s the group of people I’ve been hanging with lately. Tim and Henry – Pack of Lies vs éS – Menikmati vs DGK – Parental Advisory? éS all the way! Menikmati is dope. My moms & dad. Chloe. Evan, Ryder, Levi Webb, Cake boy & Jarryd, Bryce, Craig, Bongi and the list goes on so shout out to all the other homies I skate with too. Maddy Robolakis and Mamkhulu Omphile for sure! WB&B * Vé.G and my skateboard.